Get ready to once again for Splash 'n Dash Aquathlon Series! 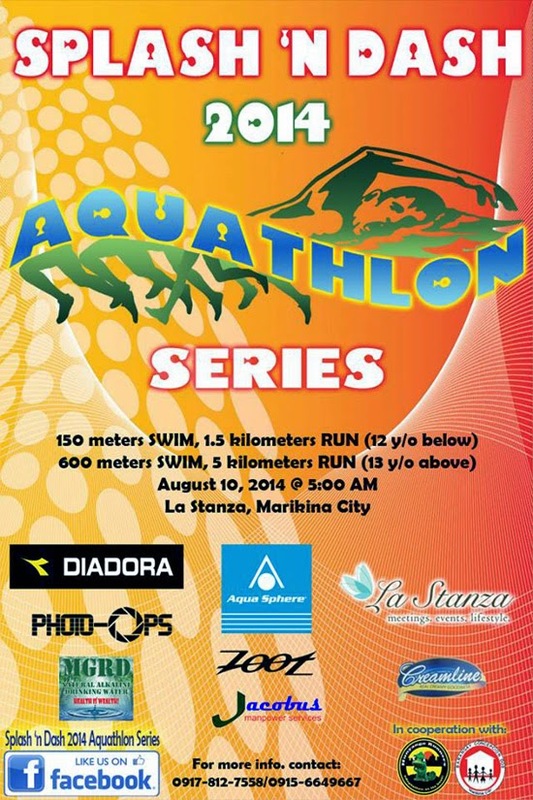 Come and run with Splash 'n Dash 2014 Aquathlon Series Leg 2 on August 10, 2014, Sunday 5:00AM at La Stanza, Marikina City. Splash ‘n Dash Aquathlon 2nd Leg will have a distances of 150m swim & 1.5km run for the kids and 600m swim & 5km run for the adults. The event is to promote friendship, camaraderie, sportsmanship, fitness, health and wellness. Be part of our fun event! Register up now! *Part of registration fee will be donated to chosen charity of the event. *** Email the scanned/photocopy/picture of Registration form and Deposit slip to splashndashaquathlon@gmail.com. Visit Splash 'n Dash 2014 Aquathlon Series Facebook page for more details and latest updates.